Established in 1819, the Bakewell Show has a long tradition of celebrating rural life and farming in the Peak District. It’s a great day out for all the family. Townies visiting the Peak District will feel like they’ve stepped into episodes of the BBC’s Countryfile programme, The Great Allotment Challenge and The Great British Bake Off, all in one go. There’s everything going on at The Bakewell Show from show jumping, a dog show, a sheep show, classic cars, a band and a horticultural show. The good news for families is that children under sixteen can go in for free. 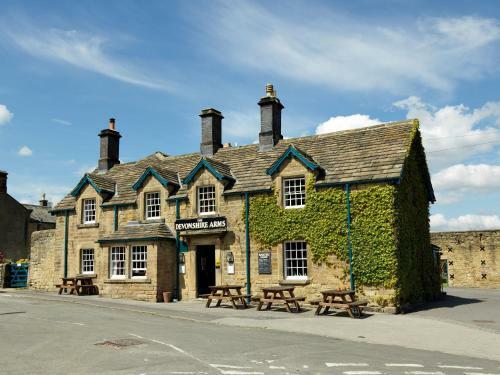 Your own Mr Hendricks will have a great time too because they love dogs in the Peak District. The highlight of the summer calendar in the Peak District, the show attracts locals and visitors alike. In early August, they flock to the Bakewell Showground in the heart of this lovely town to enjoy a diverse range of attractions spread over three days. It temporarily takes the emphasis off the town’s famous Bakewell pudding and places it firmly on food and farming from the whole region. The show kicks off gently with an equestrian day as some of the stand holders are still setting up. You’ll see a bit of everything from dressage to ex race horses and working hunters. The following day, the full event begins. Some of the most popular areas are the Food and Farming Marquee and the Farmers’ Market. Foodie Travellers can peruse the stands of local food producers and taste their way through specialities from pies to pickles. There are competitions for cheese and meat products and displays of prize vegetables and flowers. Entertainment for children includes a funfair, traditional donkey rides, Punch & Judy shows, and even vegetable theatre performances and workshops from the aptly-named Madame Zucchini. Children can also enter and exhibit at the show. Classes range from baking brownies, making animals from vegetables and fruit, to creating a 5 foot scarecrow. Animals of course, take centre stage. Watch the parade of hounds and the Grand Parade of livestock winners (which takes place on both days). At The Sheep Show, learn about the different breeds, watch a sheep shearing demonstration and see wool spinners at work. Best of all in Mr Hendricks’ opinion, there’s a dog show. I’m yappy. It’s one of the best days out for me. Can I enter the dog show? Discover more Food Festivals & Events.